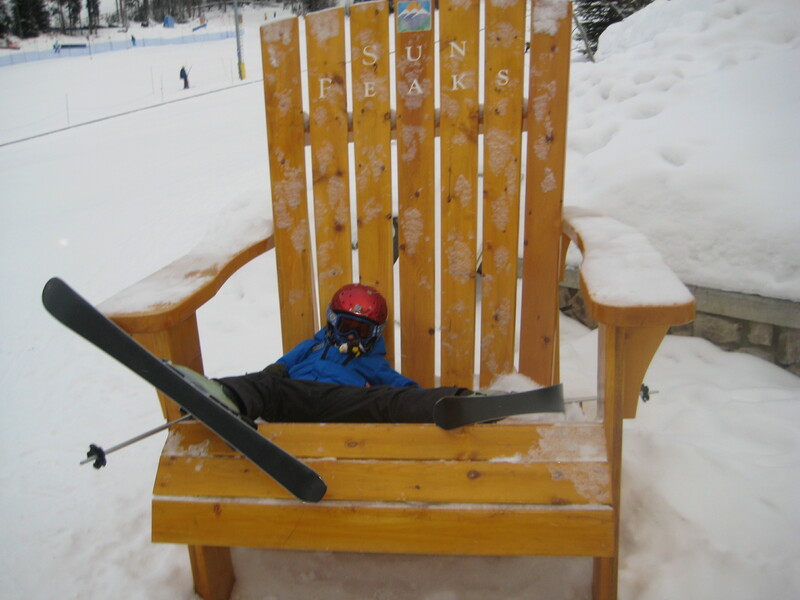 I knew my seven-year-old son was having fun in his ski lesson when he refused to take a pee break. I know, because I would have done exactly the same thing at his age. And I also know it usually ends badly. “How good a skier is he?” his private ski pro, Hamish-with-the-un-identifiable-accent, had asked at the start of the lesson. Emmett, who hadn’t been looking forward to me ditching him on this ski lesson, instantly reconsidered. He checked out Hamish’s skis, then his face. He took in the beard, the bandana, the badass helmet. “See ya, mom!” And with that I was ordered to take a hike. Hamish was in the building. I can’t tell you much about the actual lesson. I used the time to explore Sun Peaks’ sidecountry with a pack of really good guys intent on trees and untracked powder. But I can tell you with some authority, that the lesson went extremely well, ’cause like I said, at several points during the lesson Emmett had refused to go in to go to the bathroom. “He’s had an accident,” Hamish-with-the-un-identifiable-accent said to me at pick-up. Emmett didn’t speak, but vigorously shook his head. “I bet.” I said to Hamish. We smiled at each other. At least I think we did. It was so cold, both our mouths were covered by bandanas. “Better go, huh Emmett?” I asked my son. He nodded, again vigorously, and started to slide away on his skis. He was walking a little funny. “How’d the lesson go?” I asked as we headed for the Delta Sun Peaks’ laundry… though I already knew his answer. I believed him. I knew he had a good time… he peed his pants on the ski hill. This from my son, who’s skiing Sun Peaks, BC for the first time, and is showing remarkable talent for sniffing out good glades. It doesn’t matter how steep they are, how tight they are, or even if they’re tracked. He beetles from one set to another like a remote-controlled stock car commandeered by Bart Simpson. 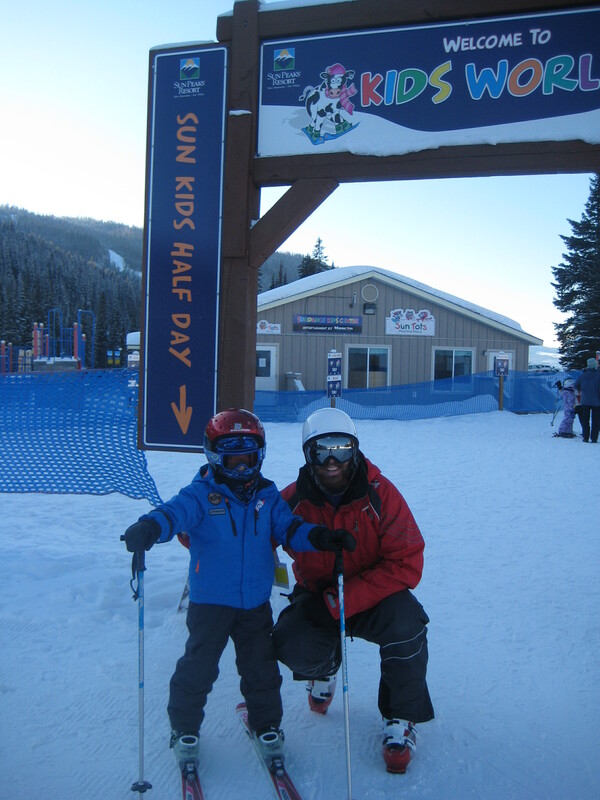 According to Emmett, the best treed runs at Sun Peaks so far are the Cahilty Glades off the Sunburst Express — well spaced, but not too easy; the trees between Granny Greene’s and Homesteader on Sundance; and Mt. Morrisey’s “easy-peasy” The Sticks. Nancy Greene with the Nancy Greeners! Nancy was cool about heading into Cahilty trees on the first run of the day — she had to be, otherwise the kids on the ski team would mutiny — but the camera crew was a little challenged! 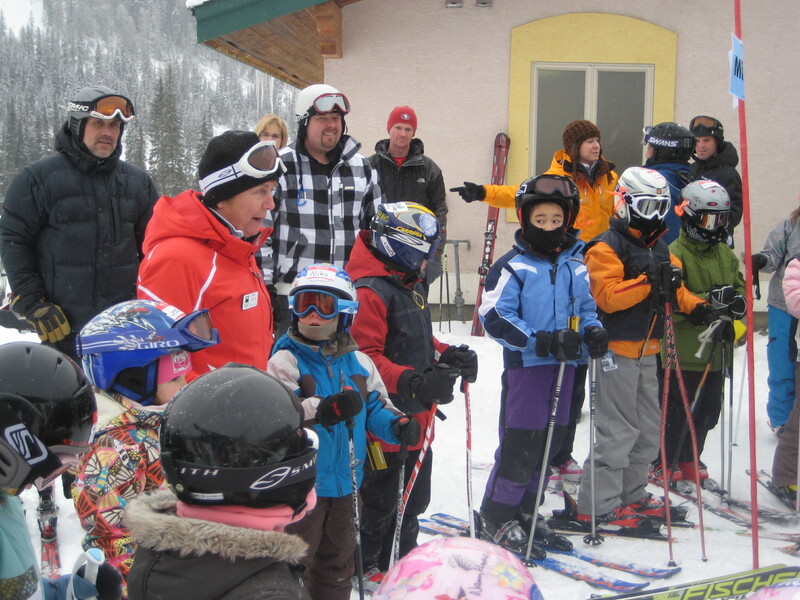 They duck-taped a wide-angle camera to her skis and got action shots of her skiing with all the kids around her. 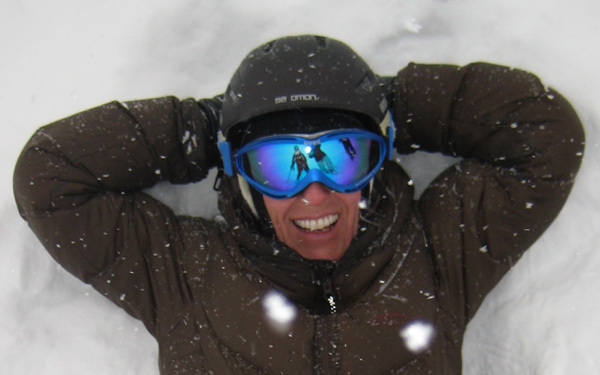 “Kind of hard to ski with one ski slow and the other fast,” she said, waving the ski/camera around. She blew it off eventually–made one of her quick slalom turns through the trees and the camera went rolling. At the bottom of Cahilty she stopped — a rare occurrence for energetic Nancy — and pointed back up at the glades. Emmett nodded his head. He totally got it. When you’ve got glades, who needs gates?